[QODBC-Desktop] How Can I use QODBC with two different versions of QuickBooks installed? How Can I use QODBC with two different versions of QuickBooks installed? I have two different versions of QuickBooks (i.e. QuickBooks Enterprise 2012 & QuickBooks Enterprise 2014) installed on my machine. I want to access both versions of QuickBooks using QODBC Auto Login. I have configured QODBC Auto Login for both QuickBooks company file by creating two DSN & provide a company file path to both DSN. But I can access only QuickBooks 2014 company file using QODBC. I am unable to access QuickBooks 2012 company file using QODBC auto login. I am getting below error when I try to connect QuickBooks 2012 company file using QODBC auto login DSN which I have created earlier. QODBC uses QuickBooks SDK to communicate with QuickBooks Company file. QuickBooks SDK requires QuickBooks UI to extract data from Company file. Thus, when you have configured QODBC to run/use Auto Login to QuickBooks, QuickBooks UI will be loaded in background and company file will be loaded on it (by QuickBooks SDK). When there is multiple QuickBooks version, QuickBooks SDK will start any one of the QuickBooks versions. This is because the QuickBooks SDK does not know which Company file is associated with which QuickBooks (until the company file is opened). For Example: You have installed QuickBooks 2012 & 2014 on a single Box. 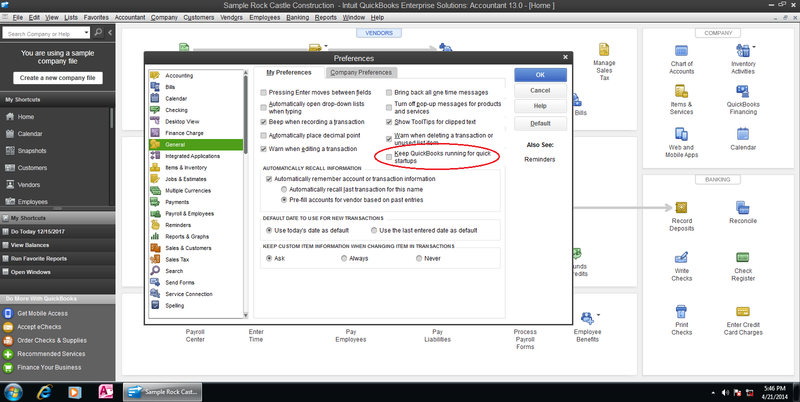 Configured QODBC Auto Login for QuickBooks File for 2012 ( QODBC A). Configured QODBC Auto Login for QuickBooks File for 2014 ( QODBC B ). When QuickBooks not running in background. Connecting to QODBC A - SDK is able to QuickBooks 2012 and able to connect. Connecting to QODBC B - SDK is able to QuickBooks 2014 and able to connect. When QuickBooks 2012 is running in background (QBW32 gets started on windows start - its configurable in QuickBooks ). Connecting to QODBC B - SDK is able to QuickBooks 2014 and able to NOT connect - as company file is new version. When QuickBooks 2014 is running in background (QBW32 gets started on windows start - its configurable in QuickBooks ). Connecting to QODBC A - SDK is able to QuickBooks 2012 and able to NOT connect - as company file is new version. You are getting error when you are trying to connect older version company file. Because there is already QuickBooks exe for 2014 version(QBW32.EXE) is already running in the background. You can check it via task manager. So the solution is to remove QuickBooks from auto start on windows start. 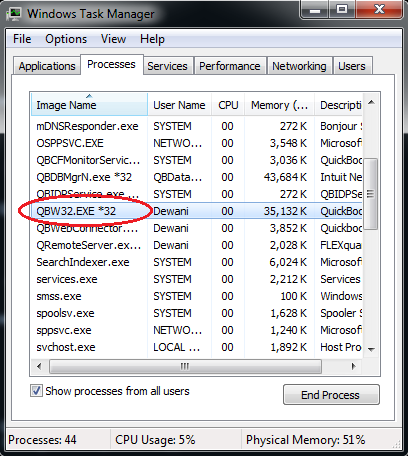 So if QBW32.exe (2012) is running, connection cannot be made via QODBC DNS for company file of 2014 ( QODBC B ). So if QBW32.exe (2014) is running, connection cannot be made via QODBC DNS for company file of 2012 ( QODBC A ). QuickBooks is running in the background due to the option of "Keep QuickBooks running for quick start-up" under QuickBooks -- Edit Preferences -- General is enabled. Please make sure you un-select the option of "Keep QuickBooks running for quick start-up" under QuickBooks -- Edit Preferences -- General.